Nicholas “Nicky” Brendon Gives the Best Hugs! They say don’t meet your heroes, they will only disappoint you. I have met a lot of celebrities that I thankfully wasn’t a fan of who were arrogant, rude, and acted like they were better than everyone else. However, when it comes to meeting the people that I admire and am a huge fan of, I have been very lucky. I am not ashamed to say that I am a big fan of television. TV is so much more to me than just something to pass the time-it has literally saved me. It’s given me courage, hope, inspiration, escape, joy, and kept me from feeling alone. So, most of the people whom I admire are people who have been a part of creating television. I met Stephen J. Cannell three times! I also have had the chance to meet Patrick Stewart, and Amber Benson (from Buffy the Vampire Slayer. Last year I met Hank and John Green-connected my other love, books. Every one of them was wonderful! Anyone who knows me knows that Buffy the Vampire Slayer is my all time favorite show. Last week I met another actor from Buffy, Nicholas Brendon, who played Xander. I had no idea what meeting him was going to be like, but I got the chance to do an email interview with him before the event and his answers alone told me I wasn’t going to be disappointed when I met the man in person. To say he didn’t disappoint, would be an understatement! 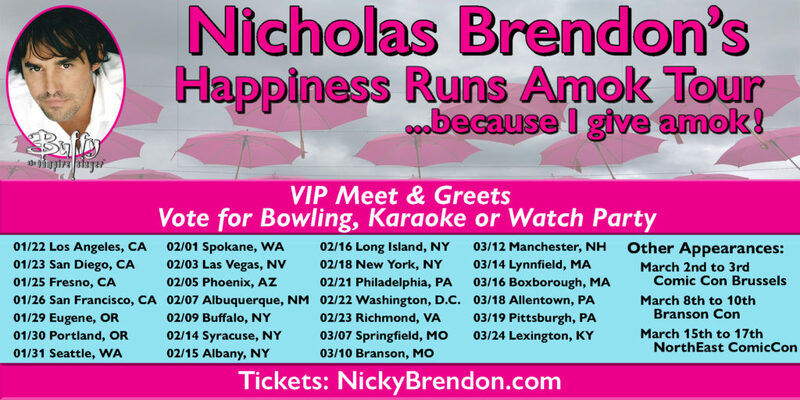 Nicholas is doing a tour that he calls “Happiness Runs Amok…because I give Amok!” He is doing watch parties, bowling parties, karaoke, and he even did a tattooing party, but more than anything, he is giving back. These small to relatively small intimate gatherings are about giving back to his fans and about helping those with mental illness have an evening of joy, though as he says in an interview I listened to recently, you don’t have to be struggling with mental illness to come and have fun. 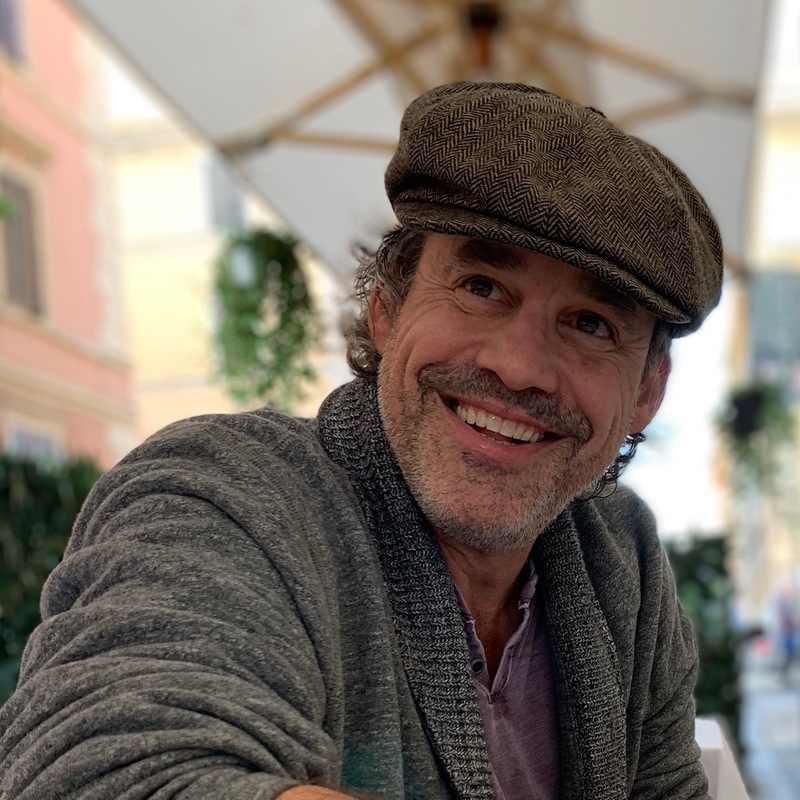 “It’s not just about helping those with depression it’s about focusing on happiness and love,” shared Nicky in my interview with him. However, one of Nicky’s goals with these events is to give those of us who suffer with anxiety and/or depression (which he also struggles with), the motivation to get out and have fun (which for many of us can be hard). We not only get to have fun with Nicholas, or Nicky as he likes to be called, but also with like minded people. Ours was in Fresno and was a watch party. 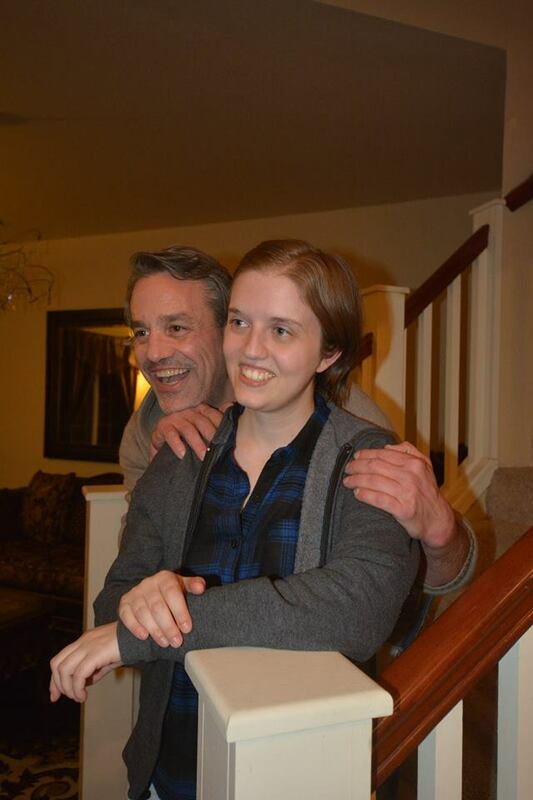 When my daughter and I got there, we soon found out that we weren’t the only ones who almost let our social anxiety keep us at home-and yet we didn’t because this was too important-this was Buffy! Nicky went out and picked up Chinese food, we ate, and chatted until we were done, then went upstairs at the Airbnb to a media room and “watched” the Buffy episodes “Hush” and “Once More With Feeling.” We sat on couches, and chairs, and pillows on the floor and talked and listened to Nicky talk, more than we actually watched. We sang along with the musical episode of course. He shared behind the scenes stories from Buffy and stories from his life (he is very open about the struggles he has been through)-he was full of energy and had us laughing nearly the entire night. He made us feel like we were hanging out with a friend. He was real and down to earth, and maybe one of the kindest and sweetest people I’ve ever met. Nicky even made of point of learning all of our names, which I thought was amazing! Later he autographed photos, and took selfies, and there was a lot of hugging. Nicky is the best hugger ever. It was one of the best nights of my life and my daughter’s too. Nicky is doing just what he set out to do-spreading happiness! You left feeling like you had not just met a star from your favorite TV show, but like you had made a friend. Well actually, make that two friends. By his side, organizing and helping make it all happen was his sweet girlfriend/event coordinator and social media manager Sarah Allison. We may have actually left there having made even more friends because we all bonded with people who were there for the same reason we were-a love of Buffy the Vampire Slayer, and of Nicky. The tour continues and if you are a fan of Buffy and you get a chance to go-take it! Don’t ask if it’s worth the ticket, or worry that you will be disappointed-it is worth it and more, and you will walk away like we did, loving Nicky and Buffy even more than we did before. Like I said, the people I admire that I’ve been lucky enough to meet have not disappointed me yet. Not even a little. And in this case, Nicky even exceeded my expectations. But when you meet someone you admire, make sure that you remember that the people we admire and whose talents we enjoy, are still just people like us-people who have been given a chance to change people’s lives with a story and the talents they have been given-whether they be a writer, or an actor, or a singer, or an artist. They will have faults and make mistakes just like us, and some of them may disappoint you, but if you are lucky like I have been, they will be people who care about their fans and really want to bring joy to our lives. And if you are someone who thinks that entertainment isn’t important-for many of us it’s more important than you could ever imagine! Our lives are not only made better because of it, but sometimes they even save our lives. Thank you Nicky Brendon for being who you are! And thanks for the awesome hugs! You can learn more about this tour on Nicky’s website and on his Facebook page.